The growing cannabis industry has an LGBTQ exclusion problem. Laganja Estranja attends an art exhibit on Feb. 23, 2015, in Hollywood, California. After decades of prohibition and an ardent fight for legalization, 2017 may go down in history as the year cannabis went mainstream. The majority of states in the U.S. have passed some kind of positive reform of the federal government’s ban on cannabis, and recreational adult use is now legal in eight states and the District of Columbia. On top of that, various polls have found that the majority of Americans support widespread marijuana reform, the latest of which reports that 86 percent of respondents supported either medical or recreational legalization, or both. On top of that, the industry is poised to explode into a huge moneymaker: Sales in North America are expected to hit $50 billion by 2026 compared to $6.7 billion just last year. Conventional investors are jumping onboard, and the tech industry is quickly infiltrating. But the burgeoning industry has one glaring problem: The gatekeepers of cannabis’ culture and commerce are overwhelming white, cis, straight, and male—not to mention downright bro-y. White-appropriated rasta colors and women clad in weed-leaf bikinis abound, and on the buttoned-up side of things, the ubiquitous influence of the tech-bro is essentially turning the cannabis industry into the next Silicon Valley—a space not exactly known for its inclusivity. Thankfully, there is an ongoing push for diversity of color and gender, to varying degrees of success. Women now make up 36 percent of leadership roles in the cannabis industry (compared to just 5 percent in the rest of the business world) and municipalities across the country are attempting to build reparations into their practices and policies for the communities of color that have been disproportionately negatively affected by the criminalization of cannabis. This includes the city of Oakland’s Equity Permit Program, which reserves a portion of permits for people of color and those convicted of marijuana-related crime; Washington, D.C.’s, local effort to give local minority-owned companies a preference when applying for licenses to operate medical marijuana businesses; and the Minority Cannabis Business Association’s plan to create template legislation that addresses issues of inclusion to distribute to states and local municipalities. But there’s another marginalized group that has largely been left out of the diversity conversation, and stigmatized in the cannabis industry: the LGBTQ community. Brewing within the bro culture of mainstream weed is a big dose of homophobia, and no one knows this better than Jay Jackson, aka Laganja Estranja, the choreographer, drag queen, and cannabis activist best known for competing in the sixth season of RuPaul’s Drag Race. 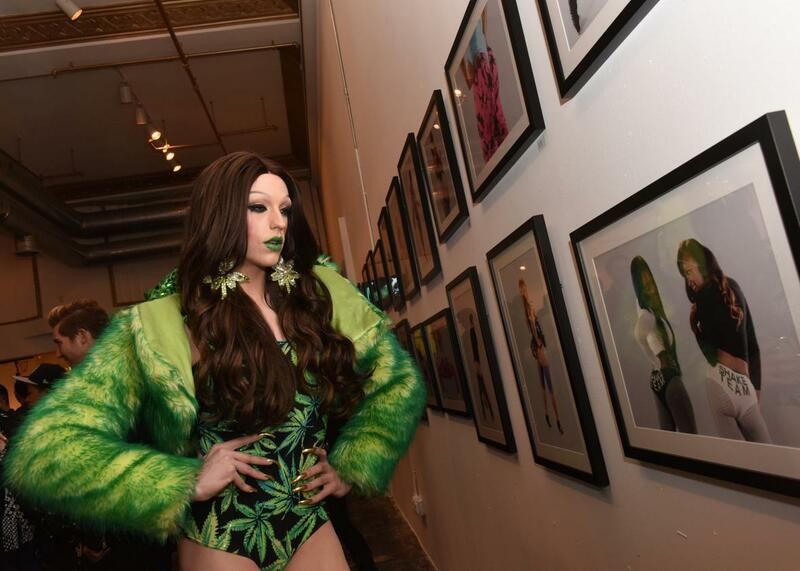 As suggested by the name, Laganja Estranja is a pro-weed queen who often dons marijuana-leaf prints and pendants and speaks about the need for gay visibility within the cannabis community. Jackson is one of just a few activists in this specific niche, which has led him to become the first openly gay individual to be featured on the cover of a cannabis magazine in 2015, when he graced the cover of Dope. Jackson has also created Laganja Estranja-branded pre-rolled joints, which he calls “the first openly gay joints on the market,” in partnership with cannabis company the Hepburns; has founded an LGBTQ-friendly medicated dance class; and recently sat on the first LGBTQ panel on cannabis hosted by the organization Women Grow. And that’s in addition to his appearances and speaking gigs at various cannabis events across the country and world, at which he’s met varying degrees of acceptance and adversity. Indeed, the first time he appeared in character at a cannabis cup several years ago, he felt so uncomfortable that he hasn’t dressed in drag at such an event since. Another activist in this space is the YouTuber Arend Richard, aka “The Gay Stoner.” As far as YouTubers go, there are potentially thousands of personalities in the gay interest space and in the “weedtuber” space, which consists of cannabis advocates getting high on screen for adoring stoner fans. But in the Venn diagram of these disparate worlds, Richard found there was no one in the middle. So he filled the niche. Now Richard has 67,000 subscribers on his YouTube channel and is tapping into the mainstream cannabis community. But it hasn’t all been positive. Like Jackson, Richard has been met with his fair share of homophobia. As a popular personality, Richard often seeks partnerships with brands and other cannabis-focused YouTube channels. More often than not, his queries are ignored, and he estimates that the majority of cannabis brands would never work with the LGBTQ community. “The homophobia in the weed community is severely real,” he said. Ignorance aside, this homophobia is even more of a slap in the face to the gay community given the fact that the legalization movement rode on the coattails of the gay rights movement. Today’s widespread acceptance of cannabis can be traced back to the country’s first medical marijuana policy: California’s Proposition 215, or the Compassionate Use Act of 1996, which was spearheaded by the gay community in the wake of the HIV/AIDs epidemic. In the early days of HIV/AIDs, there were no antiretroviral drugs, and the diagnosis was often a sentence of excruciating pain and death. Marijuana eased that pain, and the gay community fought hard for the right to use it. In fact, the man that became the symbol for the Compassionate Use Act was Jonathan West, who famously testified in court that the weed that led to the arrest of his partner Dennis Peron was in fact his. His day in court came two weeks before he died of AIDS, and the appearance is thought to have sealed the deal for voters on Prop 215. Since then, the legalization and gay rights movements have moved in parallel as progressive issues. The progress of each movement has often been measured against the progress of the other, as if a given individual or state’s progressivism can be judged by the level of support for these two causes. This interplay is evidenced by such headlines as Quartz’s 2014 article, “Why gay marriage has had more success than marijuana legalization, and what it tells us about America,” or the 2015 Mother Jones article, “Marijuana Legalization Is the New Gay Marriage,” which leads with: “Now that gay marriage is legal, what’s next? We liberals need a new movement that will once again put conservatives on the wrong side of history.” What this ignores is the fact that after Prop 215 opened the door to widespread cannabis reform, the movement was largely co-opted by those seeking profit, and those who did profit were largely straight white men. After their initial fight and win for weed, the gay community was pushed out. Jackson and Richard (and a handful of others) are doing that work one appearance and one follower at a time. In addition to his classes, speeches and branded merchandise, Jackson hopes to one day create a cannabis- and LGBTQ-friendly theater to give the gay community a place to safely consume cannabis as well as performance. And for his part, Richard is working to create a collective of LGBTQ-friendly cannabis businesses, so the community can put their money where their principles are. Additionally, he hopes to put together a 24-hour live-stream with himself and 12 other (straight) YouTubers around Christmas, which would be sponsored by various cannabis brands, with all of the proceeds benefiting LGBTQ youth. But as Jackson said, all this work isn’t about asking, or even demanding, that the cannabis community invite the LGBTQ community to the table; it’s about reclaiming a space they created in the first place.